Does weather impact your food cravings? It really does that to me. It is autumn in New Zealand, rainy days, cold weather, all those things trigger sweet cravings to me. 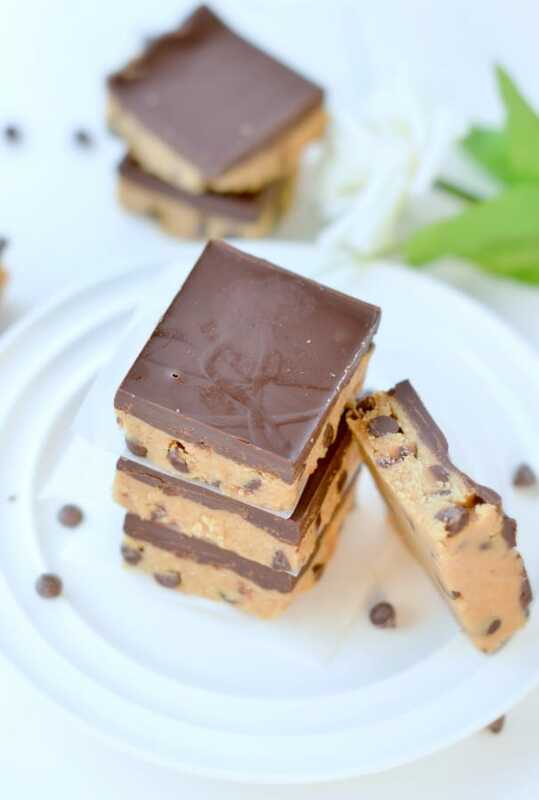 Sweet has always been my comfort food and those cookie dough bars are my guilt-free option to quickly indulge on something sweet in the afternoon. 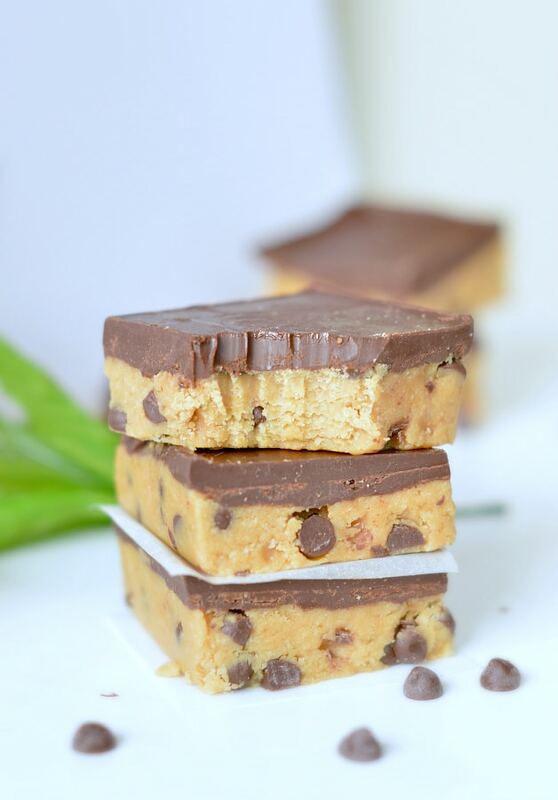 Yes, all you need is 5 simple wholesome ingredients to make those delicious cookie dough bars. Almond meal – also known as almond flour both works in this recipe. I used blanched almond meal to keep the color light but un blanched almond meal is a great healthy options to add extra fibres to those bars. Coconut flour – you don’t need much of this one but it adds the crumble cookie dough texture to the bar so don’t skip it! Sugar free liquid sweetener – many of you ask me what do I use? I am using a natural liquid sweetener made of Monk fruit also called maple flavored sugar free syrup, see here. Monk fruit is a powerful fruit that add sweeteness to food with no carbs, no sugar and barely few calories. It is working the same as regular maple syrup without the sugar, no carbs and it is good for you ! Peanut butter – I used unsalted peanut butter. Any other nut butter would work well too as soon as it is fresh from the jar. If your peanut butter is hard/dry the bars will be too and, the dough won’t get together. So use fresh peanut butter, runny and no sugar added! Sugar free dark chocolate chips – there is plenty of options here, choose the level of cocoa you like. I used sugar free chocolate chips sweetened with stevia. 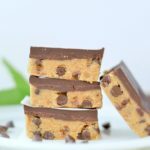 Those no bake cookie dough bars has a slightly sweet crumbly peanut butter chocolate chip layer that taste like raw cookie dough ! The chocolate peanut butter layer on top is soft, smooth and melt in your mouth. The blend of both texture and taste provide the best sweet treat experience. A cookie dough square contains 7.2 g protein and only 6 g net carb. That is a fulfilling treat that will fix your sweet craving in a healthy way! Full nutrition panel after the recipe card. 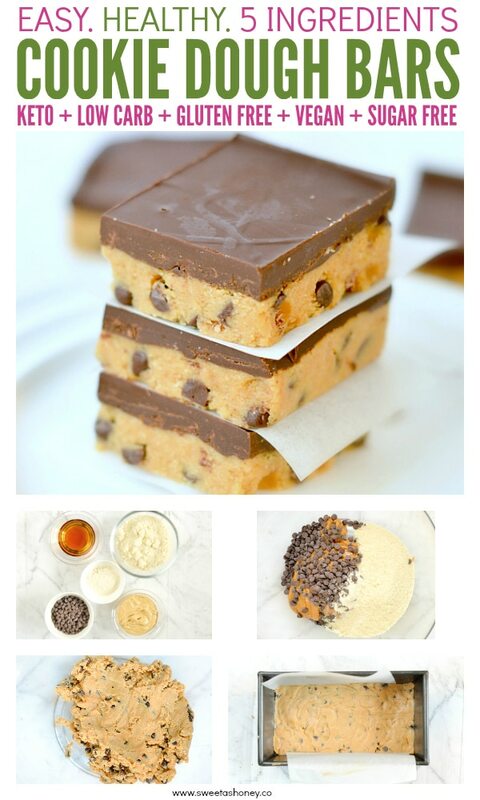 I hope you enjoy this cookie dough bars recipe. I am eating the last square while posting this recipe. I must make more very soon ! 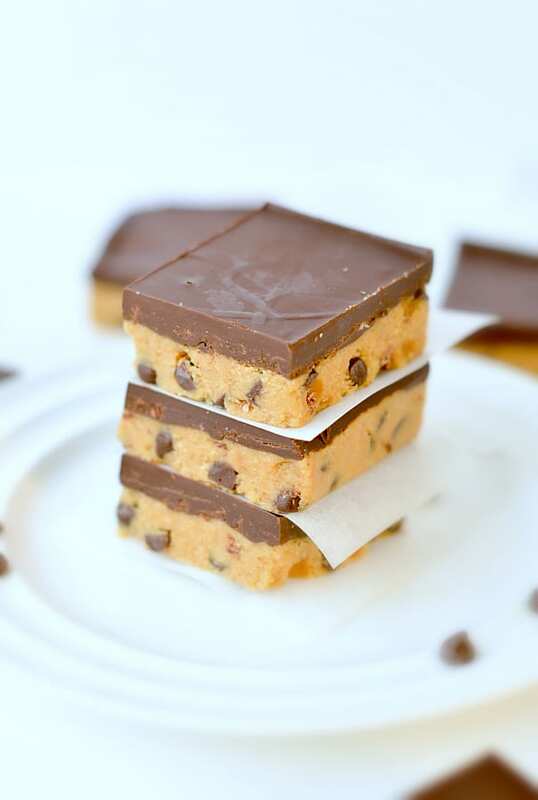 Watch the cookie dough bars recipe video and make them now ! In a medium bowl add the liquid sweetener and peanut butter . Microwave 30 seconds - it will be slightly warm up, stir to combine. Set aside. Add the almond flour, coconut flour and chocolate chips. Stir until fully incorporated. It will form a dough that you can easily shape as a cookie dough ball. Press the dough with your hands to cover all the bottom of the pan. Ue a spatula to make the surface flat and smooth. Freeze while you prepare the chocolate layer. In a bowl add the sugar free dark chocolate and nut butter. Melt by 30 seconds burst in the microwave stirring between to avoid the chocolate to burn. It should not require more than 90 sec. Stir well to combine and form a shiny melted chocolate mixture. Remove the loaf pan from the freezer, pour the melted chocolate onto the bar. Use a spatula to spread the layer evenly. Freeze again for 10-15 minutes or until the chocolate layer is set. Cut into bars using a sharp knife. You can warm the knife blade slightly to make the cutting even easier. This recipe makes 8 square bars. Store the bars in the fridge in a airtight plastic container or plastic bag for up to 10 days! Sweetener: I am using a sugar free syrup made of monk fruit sugar, it is a natural low carb sweetener with a delicious natural maple syrup flavor. If you can have sugar use regular maple syrup or agave or brown rice syrup. Chocolate: I used sugar free dark chocolate. It is a 70% cocoa chocolate sweetened with stevia but you can also use a stronger chocolate, a 100% sugar free chocolate will be great too or 85% cocoa. Nut butter: I used peanut butter, fresh is better as it is runnier and it is easier to blend with the sweetener with a slight rewarm in the microwave. Other options are almond butter or cashew butter. 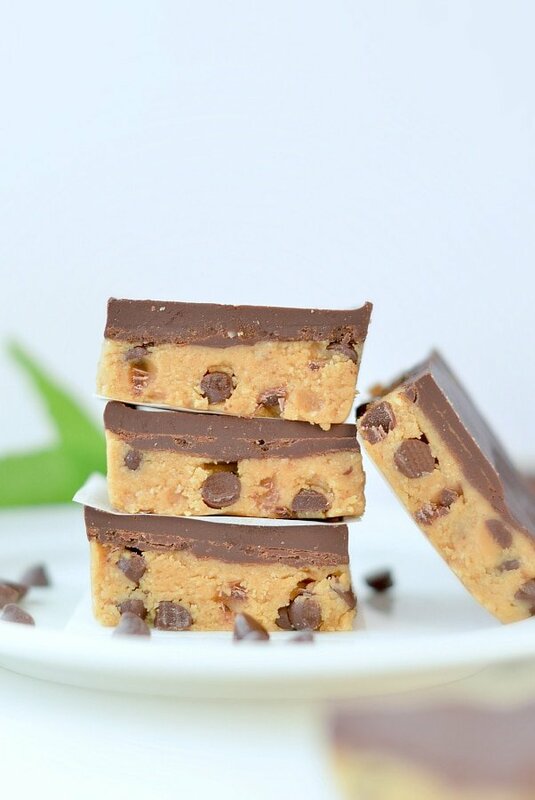 I would LIVE to make these vegan cookie dough bars for my family . However, two of my beautiful children are deathly allergic to tree nuts and peanuts , as well as wheat, dairy, sesame, shellfish, bananas, peaches, melons and latex. Can you tell me what I could substitute for the flours? I can substitute the peanut butter for Wowbutter ( made with sunflower seeds). I do have a gluten free flour ( we CANNOT use almond flour). I’m also not sure about Monk fruit. I have ” safe” chocolate chips that I can use as well. Thank-you for any help / tips ! It’s very difficult to cook for a family with food allergies. But we love to eat delicious food, too !!!! Hi Corrine, I’m a bit confused because it says in your blog that these are 0.9g net carbs but the nutrition box would indicate 6 net carbs as 3.9g fiber and 9.9g carbs. Which is correct? Just I would love to make these ( if I can ever find monk fruit sweetener in the UK!) but 6 net carbs is a bit much for me as I have to keep my levels at 20g for a whole day! Thank you. Hi ! I am sorry for the typo issue (it is 9.9g carbs, 3.9 net carbs). The nutrition panel is correct. 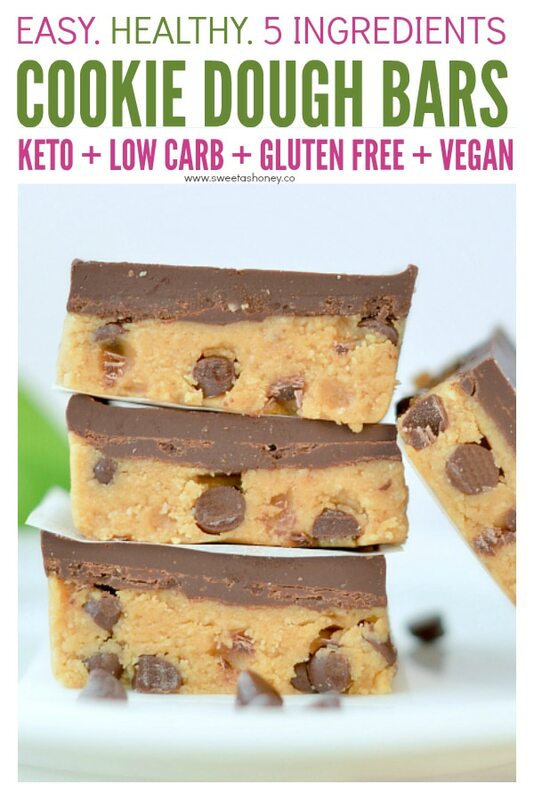 There is 6 g net carb per bar BUT note that those are big squares. I cut them into 8 large sqaures but honestly you can easily cut the bars half to decrease the carbs per intake. They are highly fulfilling and you don’t need as much. 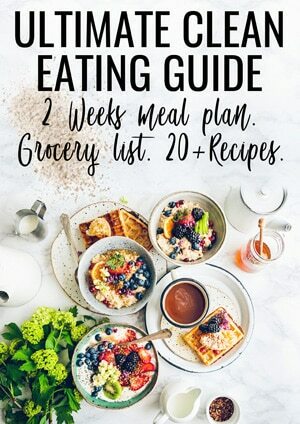 This way you will get only 3 g net carbs per treat and still fix your sweet cravings! If you can’t find Monk fruit in US you can order online, that is how I source most of my product in NZ (we don’t have lots of choice here! ). Have a great day. Is sugar free maple syrup (like pancake syrup) the same ? It will taste like pancake syrup indeed without the sugar and only natural sweetener! So if you are on low carb or keto diet, sugar free maple flavored sysup made of Monk fruit is the best! You can find some here. 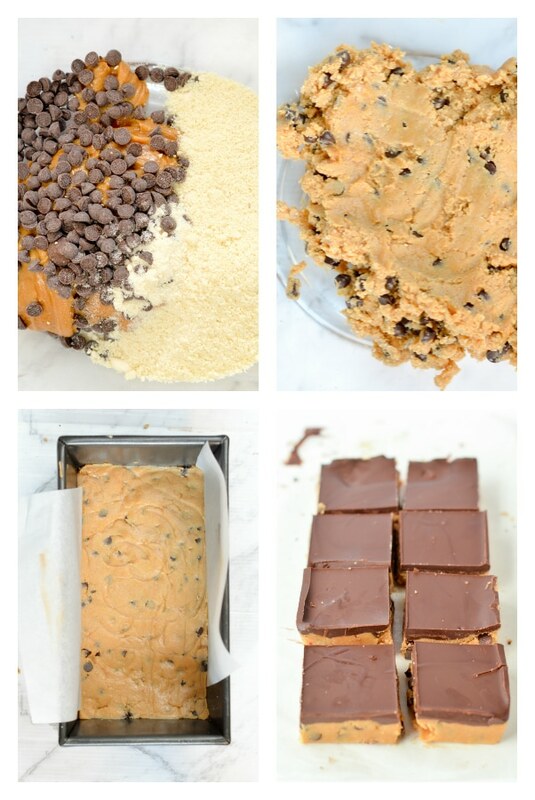 Enjoy the cookie dough bars. XOXO Carine. Is there a way to find out how much sodium is in one bar? I updated the nutrition panel to show the sodium amount. Note that I am using peanut butter without salt added. The recipe serve 8 bars and nutrition panel is for one bar so 6.1 mg sodium per bar if you use the exact same ingredients. Enjoy the bars. XOXO, Carine.